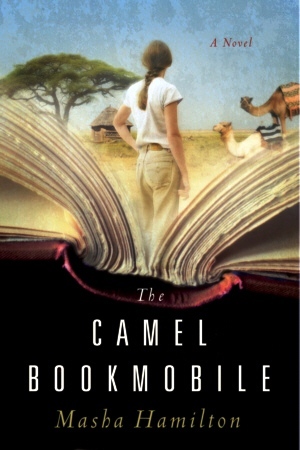 In THE CAMEL BOOKMOBILE, Masha Hamilton tells the story of a restless American librarian searching for more meaning in her life who travels to Africa to help start a library carrying books to remote settlements on the backs of camels. The bookmobile divides the semi-nomadic people it intends to serve: Scar Boy, the village teacher Matani, and others embrace it, seeing it as a much-needed taste of the outside world, while Matani’s wife, her father and others fiercely oppose it, viewing it — and the librarian herself — as a dangerous and corrupting force. The settlement disintegrates under these pressures, while the librarian learns that cultural chasms can confound the best of intentions and doom an unexpected love. When Masha Hamilton’s first novel, STAIRCASE OF A THOUSAND STEPS, was published in 2000, Booklist called the book “delightfully compelling,” while Publishers Weekly wrote that “Hamilton is a natural storyteller.” It was a Booksense choice and a Barnes & Noble Discover Great New Writers selection. Her second novel, THE DISTANCE BETWEEN US, also received a starred review from Publishers Weekly, which called it “an affecting, viscerally charged work that offers no easy answers,” and was selected by Library Journal as one of the best books of 2004. Hamilton lives in New York where she teaches novel-writing and is a shiatsu practitioner.